New Zealand director Vincent Ward is renowned for his dark and moody films like the award winning medieval odyssey The Navigator and Map of the Human Heart. His next outing, River Queen, staring Kiefer Sutherland and Samantha Morton, looks set to continue that trend. 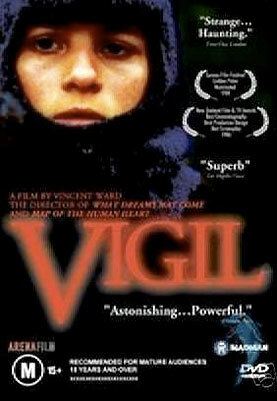 But it was his first feature Vigil that set the tone for all that was to come. It’s a fabulously feral film about a kiwi family eking out a living on a remote property in the high country. Squelching about on their lush, sodden farm they become almost part of the landscape; their random clothes are mud-splattered like sombre oil paintings and their faces seem sculpted by the mist and rain that swirls incessantly around them. Young Toss (Fiona Kay) is perhaps the most home grown, almost like a native animal, frolicking about and whooping it up in her claret-coloured beanie. But when her father (Gordon Shields) dies after a precipitous fall, she swaps her head gear for his. And it’s this signature blue balaclava that pervades the film with Toss’s confused, little round face peering out, trying to make sense of the world. Making that task difficult for her is the intrusion of a mysterious hunter named Ethan (Frank Whitten) who eventually takes up with Toss’s disgruntled mother, Elizabeth (Penelope Stewart). Only her kooky grand father (Bill Kerr) seems to understand her untamed spirit which is, like the bleak screeching of the mountain birds, razor sharp. She maintains a vigil in her father’s honour with improvised ceremonies and rituals. And another one for the farm that is about to be torn away from her. But Elizabeth has no time for such things and pops Toss into a tutu for a ballet lesson. It’s a ridiculous effort. Before long Grand dad beckons with a new, ridiculous invention and she’s off in her gum boots to investigate. Shot by Alun Bollinger, who was also Director of Photography on The Oyster Farmer, the film is brimming with wonderful imagery. A long tight shot of Toss running down an emerald green, vertiginous slope is particularly memorable as is a night dream sequence where her father and Ethan joust on two white horses. This is cinema of the imagination and well worth revisiting for a dose of its windswept wildness.